The firebrat, Thermobia domestica (Packard), is quite similar in habits but is generally darker in color. The firebrat prefers temperatures over 90 degrees F but has a similar high humidity requirement. It is common near heating pipes, fire places, ovens and other heat sources. Life Cycle: Females lay eggs continuously after reaching the adult stage and may lay over 100 eggs during her life. Eggs are deposited singly or in small groups in cracks and crevices and hatch in 3 to weeks. 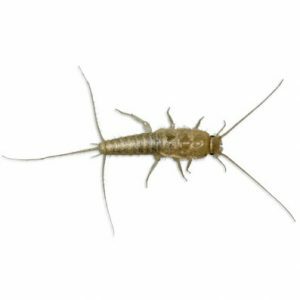 Silverfish develop from egg to young to adult within 4 to 6 weeks and continue to molt throughout their life. Immature stages appear similar to adults except they are about 1/20 of an inch long when they first hatch and whitish in color, taking on the adults’ silver coloring as they grow. They are long-lived, surviving from two to eight years. Pest Status, Damage: Primarily a nuisance pest inside the home or buildings; can contaminate food, damage paper goods and stain clothing; medically harmless. Many of their habits are similar to cockroaches and they appear to be more common as household pests in drier parts of the state. Occasionally damage book bindings, curtains, wallpaper.